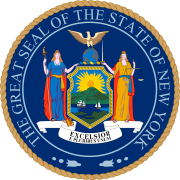 The New York gubernatorial election of 2002 was held on November 5, 2002. Governor George Pataki, the two-term Republican incumbent, ran for a third term. Governor Pataki was re-elected to a third term, defeating Democrat Carl McCall and Rochester billionaire Tom Golisano (who ran on the Independence Party line). As of 2018, the 2002 election is the most recent election in which a Republican was elected Governor of New York. In New York state politics, the proliferation of parties and ballot lines ensures that each candidate attempts to be listed under multiple ballot lines. Besides his standard Republican nomination, Governor Pataki sought the nominations of the Conservative and the Independence Party. Golisano, who sought (and ultimately won) the nomination of the Independence Party, also ran against the Governor in the Conservative primary, spending over $20 million (or over $2,000 per vote) during the primaries. Pataki secured the Republican and Conservative lines, while Golisano successfully defended his hold on the Independence Party ticket. Comptroller Carl McCall defeated Andrew Cuomo at the Democratic State Convention, and Cuomo withdrew from the race less than a week before the Democratic primary; however, his withdrawal came too late for his name to be removed from the Liberal Party line. Since Liberal Party supporters could no longer support the Democratic candidate on their own party's line (and thus ensure that the Liberal Party would maintain ballot access by virtue of having 50,000 or more votes cast on its line in the gubernatorial election), Cuomo's defeat effectively helped to destroy the Liberal Party. ^ www.elections.state.ny.us 2002 Primary Canvas.